Chandeliers can serve two vital roles by not only illuminating larger areas but acting as the essential centerpiece of a space. Once considered appropriate only for elegant or formal rooms, chandeliers are now available in a wide range of styles and sizes to complement a variety of decors. Barn Light Electric offers a comprehensive Chandelier Collection, in both porcelain enamel, powder coat, and natural finishes. These range from RLM-inspired barn chandeliers to rugged, industrial styles, sleek contemporary designs, and even schoolhouse chandeliers like the University 4-Light Chandelier above. As you might guess, we have a definite love of barn-style lighting and our talented team of artisans has created an assortment of multi-light chandeliers utilizing our most popular warehouse shades. 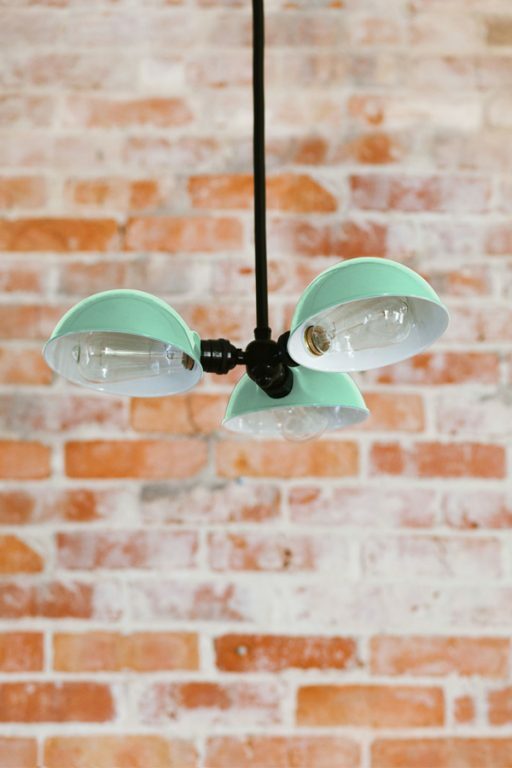 Many of these are crafted from steel and finished with porcelain enamel – a manufacturing process that started back in the early 20th century with this country’s first lighting companies. 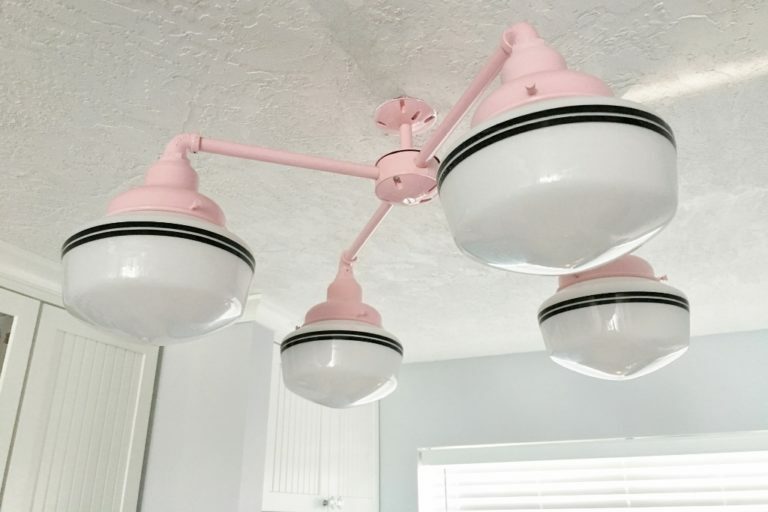 The Hancock 3-Light Chandelier above features porcelain enamel shades on a single sturdy mount. 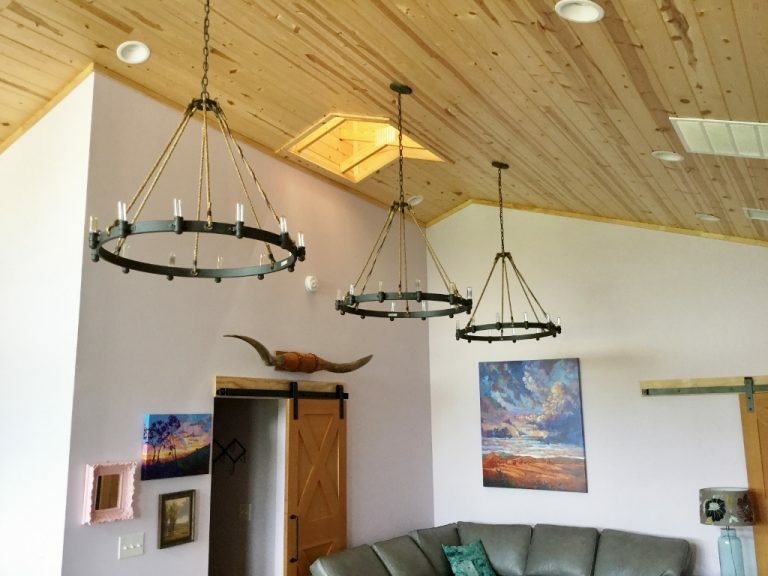 While barn chandeliers offer a laid-back, vintage-inspired look, you can ramp up the sophistication by customizing your chandelier with solid copper or brass shades. 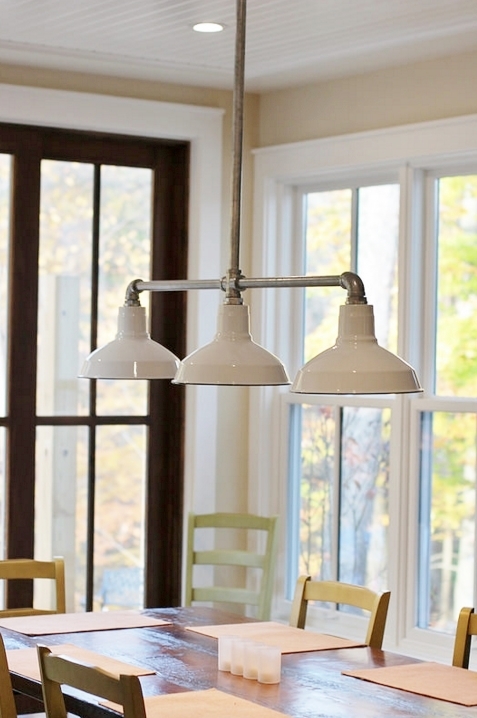 Just like all of our American-made lighting, our chandeliers are easy to customize! The star attraction in this customer’s space is the trio of rustic chandeliers that draws your eye to the vaulted ceiling. Each Outer Banks Chandelier is crafted in a 32″ size with 12 sockets finished in Shipyard Bronze. 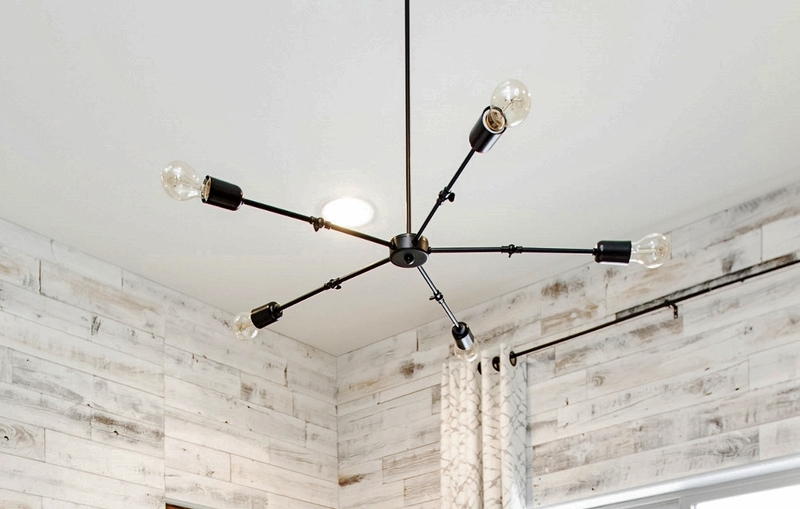 Chain hung with natural rope detailing, these rustic chandeliers exude all the farmhouse feels. For a more utilitarian look, our line of industrial chandeliers features cast guards, wire cages, and other rustic touches. 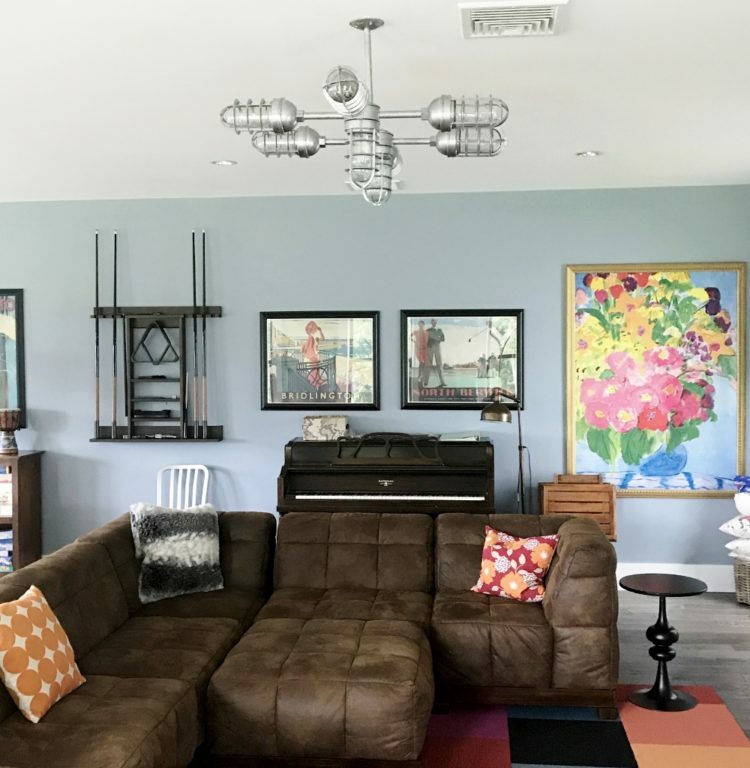 The Mercury 8-Light Chandelier, above, is a great choice for this playroom where the daily mix of kids and toys makes rugged lighting a requirement! For a mid-century look, the retro, half-dome shades of the Parabolic Chandelier recall the multi-shade lights first introduced by Benjamin Industrial. This modern version offers more customizing options than early manufacturers could ever imagine with finish, mounting, and bulb options to complement any home or business décor. Contemporary chandeliers allow the bulbs to star as many of these styles forego shades and let bare bulbs take center stage. This Downtown Minimalist 5-Light Chandelier offers a creative design featuring bare-bulb sockets attached to slender arms for an eye-catching yet subtle addition to this space. Likewise, the Ellis Adjustable Chandelier, shown above, allows the look of the fixture to change depending on the style of bulb used. 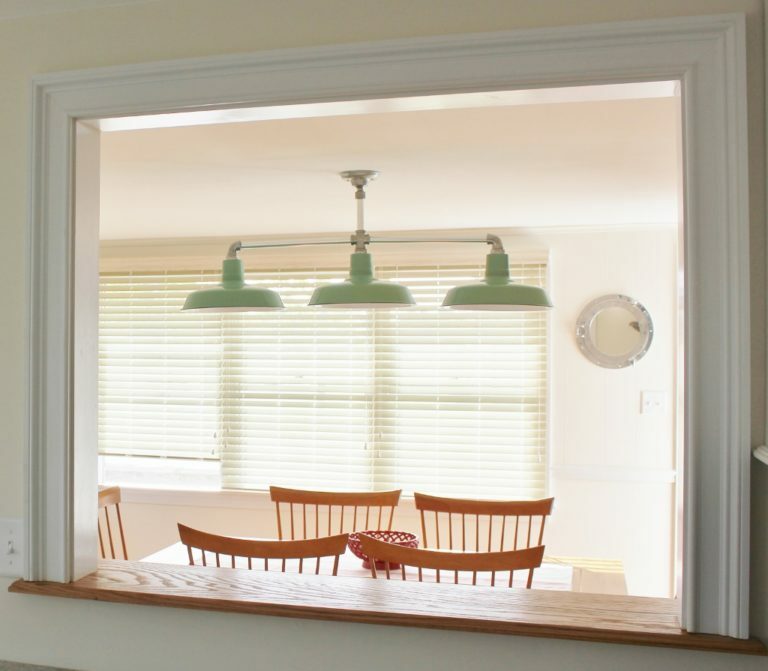 Edison style light bulbs offer a warm glow and come in a variety of shapes and wattages. No matter what your home style may be, these multi-light chandeliers serve as a functional piece of American-made art in your home!